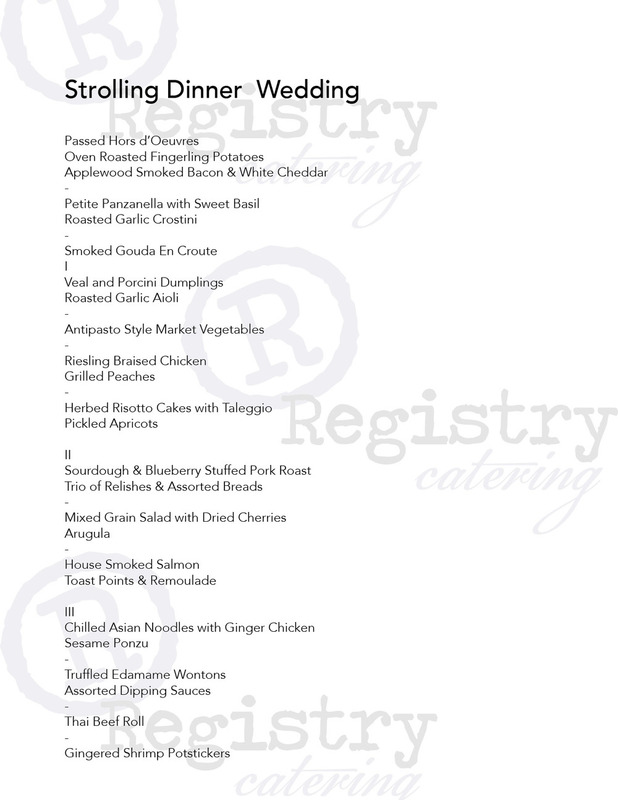 Registry is a full service catering company. Along with being inspired by and featuring seasonal bounty, Chef Erika will create a custom menu that fits your personal taste and vision. We offer many different types of service. A couple of our most unique styles of dinner service are strolling dinners and family style service. Below are more details and menus that highlight both of these service styles. These menus will give you an idea of our cuisine, but keep in mind your menu will be created specifically for you. Registry's Family Style service is a more formal style dinner service which creates a communal dining experience, encourages conversation and often turns strangers into friends. In order to maintain the a formal atmosphere your first course is plated individually. Entrées are presented family style at each table. Generally this consists of 2 meat dishes, 1 vegetarian side dish that would be appropriate for a vegetarian as an entrée or enjoyed as a side dish to enhance the full menu. We also always include perfectly prepared grilled & chilled market vegetables served along with our signature honey- wheat boulé bread. Registry's Strolling dinner invites a social cocktail party atmosphere. Strolling stations are arranged around the space to create movement and mingling within your event. Dinner service takes place while guests mingle. Formal seating arrangements generally are not encouraged. We suggest utilizing different size tables to provide more dimension to your event and encourage mingling. Formal place settings are not provided. This is not an atmosphere your guests will remain in the same place all night. Our dishes are fork friendly and petite in size. The menu is crafted to be enjoyed while socializing and the petite size offers your guests an opportunity to try many different types of food. Small plates, flatware and cocktail napkins are provided at each strolling station. All beverages are provided at your full service event bar and will be crafted by our professional bar staff. We offer bar packages for 4+ hour events. Bar service for showers and rehearsal dinners is generally charged based on consumption.